Madras Cafe is the first movie of its kind which has been filmed by the director Shoojit Sircar. The new movie deals with espionage and represents something completely different from the regular Bollywood entertainment offered by other commercial filmmakers in the industry. The story of ‘Madras Cafe’ is set against the Sri Lankan civil war, but certain parts in the first portion of the movie might seem to be a bit confusing for some viewers. 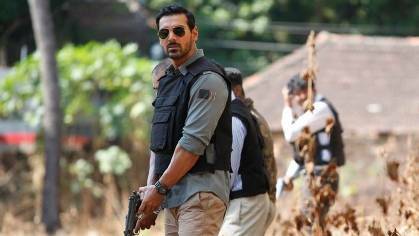 It seems like Sircar chose a different direction and has Major Vikram Singh – played by John Abraham – who narrates the whole story to a priest in church. To be on the safe side, the makers of ‘Madras Cafe’ put a disclaimer at the very beginning, saying that it is a work of fiction. The names of the events have been changed, but are clearly based on the conflict in Sri Lanka, which later on led to the assassination of Indian prime minister Rajiv Gandhi back in 1991. The role played by Nargis has not been defined properly, as she stars as a war journalist who speaks in English while Vikram replies back in Hindi. The flick is not based on entertainment, but it is a brave attempt that might not be accepted by all viewers.